Pour ceux que cela intéresse, le sixième volume de la série de vinyls DATA DISCS va bientôt sortir et il s'agit ni plus ni moins que du mythique OUT RUN ! Pour info, ces vinyls sont de véritables pépites, aussi bien au niveau de la remasterisation du son, de la qualité des vinyls et du soin apporté aux pochettes. Ils ont déjà édité Streets of Rage 1 et 2, Shenmue, Hang on... etc et bientôt Panzer Dragoon. To celebrate the 30th anniversary of OutRun, we are delighted to present a very special vinyl edition of its timeless music. Originally released in 1986, OutRun remains one of the most recognisable arcade games ever made. At its time of release, the music, by renowned SEGA Sound Team member Hiroshi “Hiro” Kawaguchi, was a triumph of imagination and creativity. It showcased a fusion of styles and influences, all ingeniously and inexplicably condensed into the confines of an eighties arcade board. The music was so integral to the game itself, that it is now difficult to imagine OutRun – or, indeed, the history of arcade music – without the enduring charm of Hiro’s soundtrack. 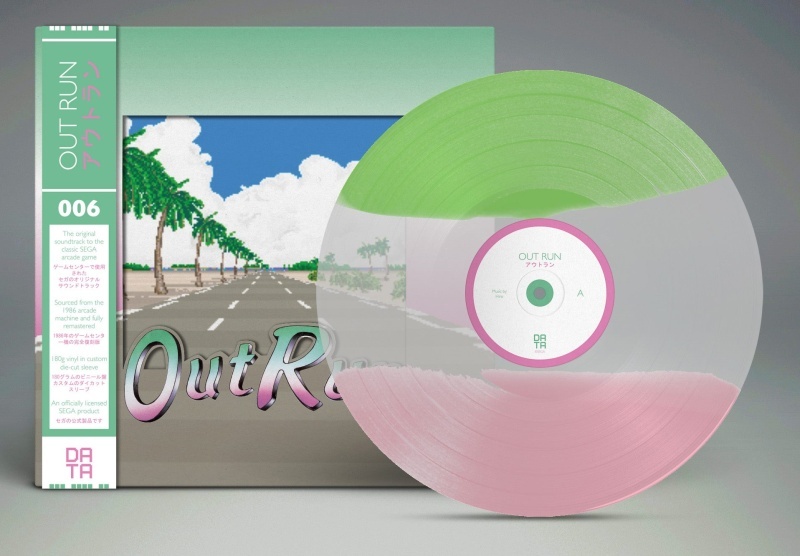 The vinyl release includes the entirety of Hiro’s original OutRun, sourced directly from the 1986 arcade machine, alongside three bonus tracks drawn from the 1991 Mega Drive and 2014 Nintendo 3DS versions of the game, all of which have been carefully remastered. It is packaged in a heavyweight 425gsm matt varnished sleeve, with custom die-cut window, three interchangeable covers, traditional OBI strip and liner notes written by Hiro himself. For early buyers, there will also be an extra special (limited to 50 copies) edition signed by Hiro up for grabs. These will be randomly assigned to people who pre-order the limited edition (green, clear and pink) within the first 12 hours of sale. Please see our website for terms and details. OutRun will be available to pre-order from Saturday 25th June at 19:00 (UK time) from www.data-discs.com. All editions are priced at £19.99 (GBP). This release is expected to ship in July. ha si moi je suis super fan de outrun!! en plus en vinyl!! J ai déjà les 5 précédents et c est vraiment de très beaux objets. Pour des sons neogeo c est assez peu probable car data travaille exclusivement sous licences officielles sega. Je ne connaissais pas le site iam8bit, merci ! J'ai acheté le street of rage pour ma part. Geistesblitz a écrit: Je ne connaissais pas le site iam8bit, merci ! For our seventh release in partnership with SEGA of Japan, we are delighted to bring together the complete music from the classic Mega Drive games, Golden Axe (1989) and Golden Axe II (1991), in one special package. This release features the unforgettable artwork from both games, supplied on two thick lithographic prints, with the record itself pressed on heavyweight translucent gold or classic black vinyl. An additional limited edition, featuring a purple swatch effect, will also be available for early buyers. The outer sleeve features rare artwork from the 1989 Japanese edition, sourced from the SEGA archives and presented on 425gsm cardstock with gold flood printing. As always, the audio has been carefully restored and mastered using the original console as the source, ensuring these memorable soundtracks are preserved for many quests to come! Please note this release is NOT a pre-order. The records are in hand and ready to ship, however we will require around 2 weeks to fulfil all orders. All editions are priced at £19.99 (GBP). Non il n'est pas encore en vente. Le "sold out" est trompeur. Il sera disponible à partir de samedi. Je te conseille de t'inscrire à leur newsletter car ils vont envoyer un code d'accès aux inscrits qui leur permettra d’accéder au site quelques heures avant la mise en vente officielle ! Le vinyl de la version remasterisée, précision. Il y a la version physique PS4 également . Oui oui, Pour la version physique, c'est déjà commandé pour ma part. pas intéressé,en effet c'est l'ost du remaster j'ai déja rez sur dc, rez l'ost en cd et rez hd sur 360. J'ai aussi sur DC et 360, mais comme la PS4 est branchée sur ma TV et plus la 360 depuis quelque temps, j'ai pris un raccourci de riche.